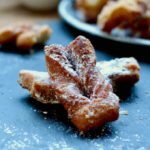 Today, I am taking you to Poland to discover the famous faworki, also called chruściki, chrusty or angel wings in English. What are faworki or chruściki? 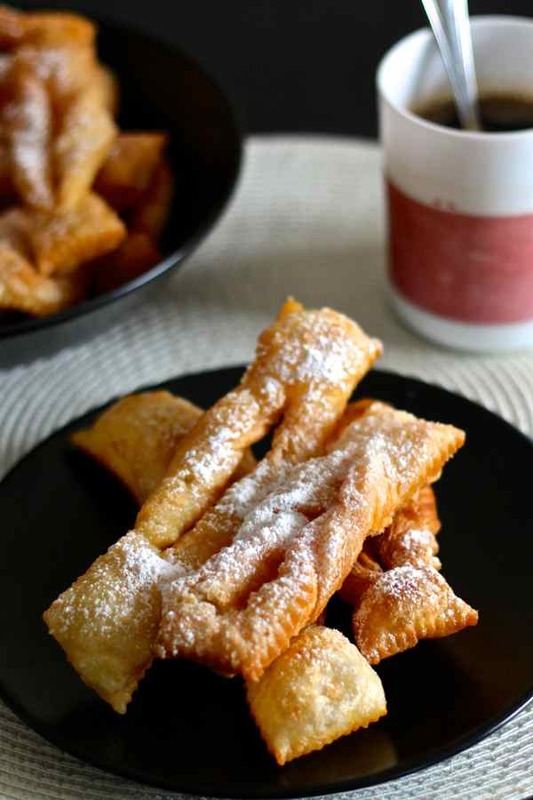 Faworki are traditional Polish donuts shaped in bow ties that are generally prepared in Eastern Europe and are close to bugnes from Lyon or merveilles du sud ouest from the Southwest of France. The word faworki literally means “grace” or “favor”. 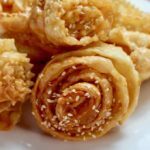 They are prepared during the carnival and in especially large quantities during “Fat Thursday”, the last Thursday before “Ash Wednesday”. They are also prepared during other holidays, including Christmas and Easter. The Polish word chrust means “dry branches” or “brushwood”. Chruścik and chrusty are diminutives of “chrust”. 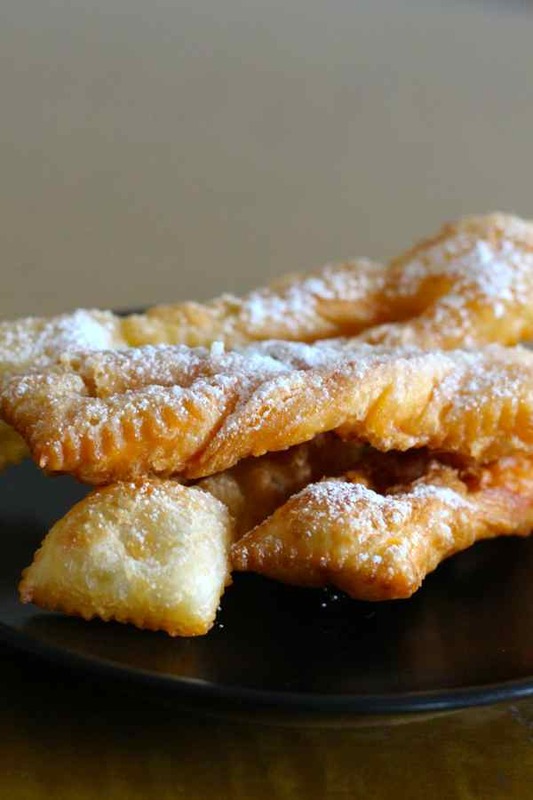 In short, you guessed it, chrusciki are crispy! In Poland, Carnival is celebrated from Three King’s Day, i.e. Epiphany and for some, even during the New Year’s Eve festivities and up at Ash Wednesday which marks the beginning of Lent. 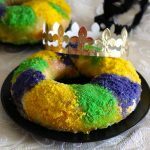 “Fat Thursday” announces the imminent end of the carnival. But do you know the meaning of the word carnival in Polish? Carnival is written karnawał, and decomposed as follows: “carne” = meat and “vale” = farewell. 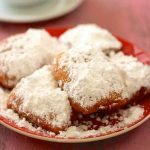 If in France, the United States, the UK, or Brazil, carbohydrates and lipids are featured on a Tuesday, in Belgium, Spain Italy, Germany and Poland, they are featured on a Thursday caled “Fat Thursday”. That day, all Polish gobble up faworki donuts to mark the end of Carnival and the imminent approach of Lent. 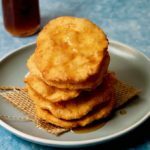 It is hard to be indifferent to so much fluffiness, crispiness but also fat and sugar … Quite a pleasant tradition before these forty days of fasting … yes, you need to pack some calories! Fat Thursday is the day of the year when you forget about good resolutions and diets and when huge amounts of donuts are prepared and consumed just to keep the tradition alive. The tradition is to prepare as many paczki (filled donuts) as faworki. Tradition requires that you eat at least one donut on Fat Thursday. And it’s even better if it is a paczki! Superstition also says that if you do not eat a second donut, you will experience poverty. Better not take a chance … there are also a lot of mistakes not to make and the number of donuts people eat can quickly increase! For example, you can’t refuse gifts from friends …. or snub the new recipe of their grandmother … If you commit any of these mistakes, you have to eat yet another donut! Eating a lot of donuts is a specialty in Poland! The specialty has also its champion, Piotr Frąckowiak who broke the record at the annual competition donuts eaters. In Poznań, he ended his 10 paczki (donuts) in 4 minutes and 12 seconds, far outdistancing its 99 competitors! Piotr Frąckowiak dethroned Krzysztof Wlazik, who swallowed 10 donuts in 5 minutes and 39 seconds. Every year on Fat Thursday, Poles eat 2 to 3 large donuts on average. The country consumes a total of nearly 100 million in one single day. Wow, with a chrusciki weighing about 2 oz, this amounts to 5000 tons in one day! OK, I will be nice with you so you can enjoy them…let me share the secret to burn the extra calories? To eliminate a faworki that weighs about 2 oz and an average of 200 calories, you should run for about 20 minutes or walk for 57 minutes! Definitely not Mike’s “Diet Starts Tomorrow” plan, it it? 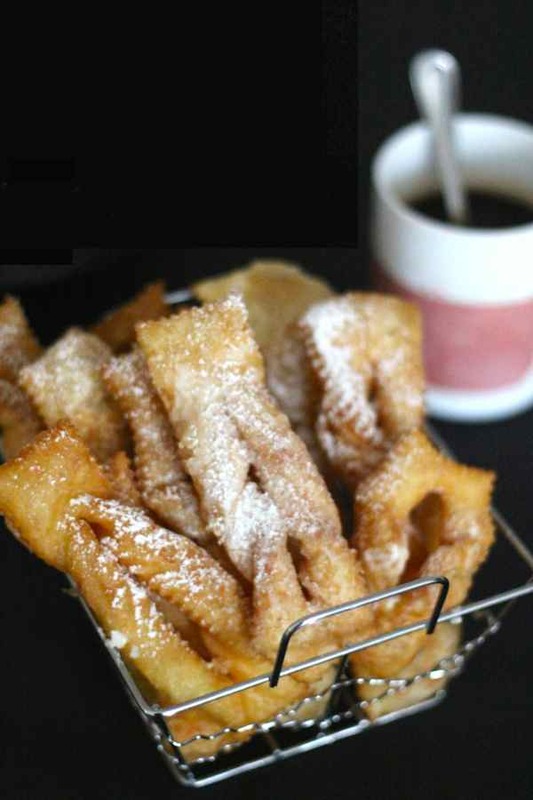 To my endless list of donut recipes, I will definitely add this excellent Polish recipe of faworki, chrusciki, chrusty or let’s say … angel wings! 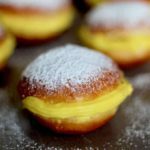 Chruściki, faworki, chrusty or angel wings are traditional donuts prepared in Poland during the carnival period until Fat Thursday. On a work surface, mix the baking powder, sugar and flour. Make a well in the center and add the eggs, cream, salt, butter, and alcohol. Knead until reaching a smooth and homogeneous dough, about 10 minutes. Wrap the dough with plastic wrap and let stand for 2 hours at room temperature. On a lightly floured surface, knead the dough vigorously (incorporate 1 to 2 tablespoons of flour if the dough sticks too much) and roll it with a rolling pin to a thickness of ⅛ inch (or thinner for crispier chruściki). Using a pastry wheel or knife, cut rectangles of about 2x1 inch and make an incision in the center of each rectangle. Take each rectangle and spread the incision to move one of its two smaller sides in this incision. Deep fry in a oil preheated at 350 F, turning chruściki halfway through cooking until very golden brown about 1 minute per side. Fry a few pieces at a time without overcrowding. Drain and place on a plate covered with paper towels. 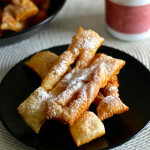 Roll in powdered sugar or sugar. Hey Barbara, sorry about your troubles. The consistency of the dough depends on the flour that you use. I was able to reach the right consistency with the above ingredients. You might want to try adding 1 whole egg or a little more of the wet ingredients next time. Hi! Thank you for the Angel Wing recipe and Tips. For Birds Milk jello, a white cream color used in between other layers of colored jello cake. I this cream is spongy like texture , but thick like., using Knox gelatin, Hvy whip cream, but no sour cream or philly cheese. This kind of Birds Milk white jello trumps all other recipes that uses sour cream, Philly etc. it an old old plush recipe that I pcan’t seem to find. My family I love rainbow jello layer cake, with the Birds Milk white layer in between the jello layers. Plz help.. holidays are coming. Big Thanks.